"Now that English sparrows have a price set upon their heads*, what is to prevent some industrious, able-bodied fellow from raising them for the bounty?" "The Washtenaw agricultural association will hold a cattle fair on the fair ground at Ann Arbor this spring. Sheep shearing prizes will be offered." 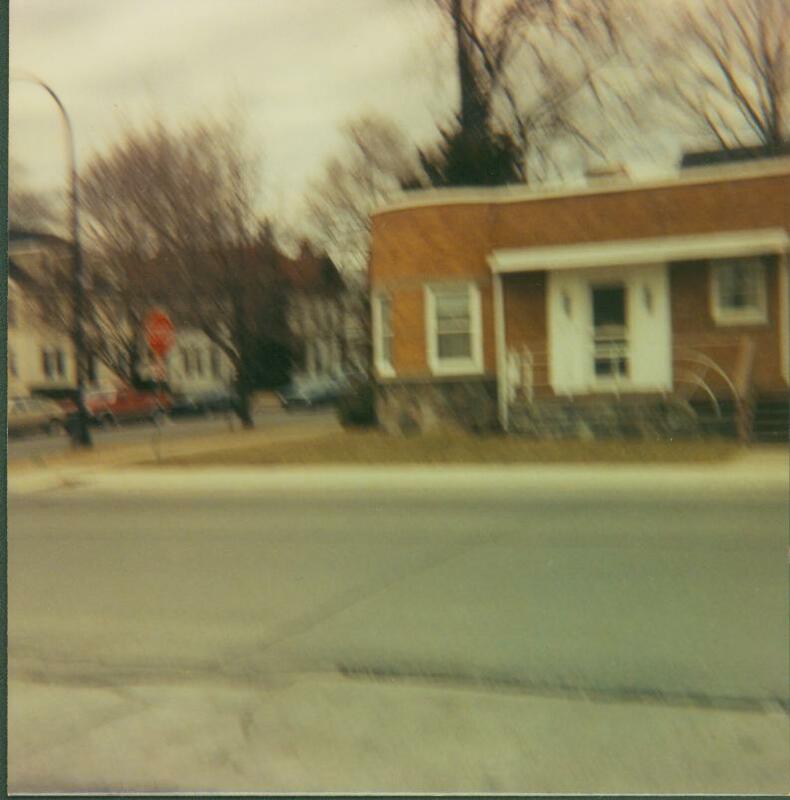 "At Fred Davis' drug store may be seen an orange brought home by Capt. 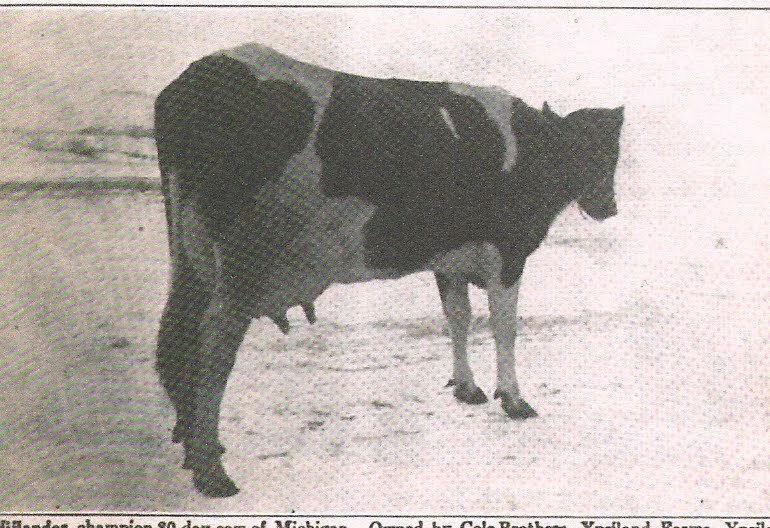 Wallace from California, which is over thirteen inches in circumference and weighs nearly fifteen ounces." "The Young People's Society of the M. E. church will give a maple sugar social in the chapel of the church next Tuesday evening. Hot biscuit and sugar will be served." *For a time a bounty was placed on English sparrows, calculated by the numbers of severed you brought in to some lucky clerk in City Hall. The non-native birds were viewed as pests to farmers. **Yes, people took a train trip to see a single painting--but this was no ordinary painting. William Wehner's enormous 1886 work 'The Cyclorama of the Battle of Atlanta' covers over 15,000 square feet and weighs over 10,000 pounds. It is the largest oil painting in the world and still exists, on display in Atlanta. The forgotten story of the Coldwater state public school for dependent children is one I'm telling in an ongoing series of stories. I'm fascinated by this complicated story that mingles tragedy, heartbreak, happiness, and hope, with two major scandals thrown in. At any rate, some of the teachers that served there were from Ypsi's Normal School. Here's a look at some of them. Thanks to the Courier. "Jane Simmons was taken to Adrian* Tuesday for one year. 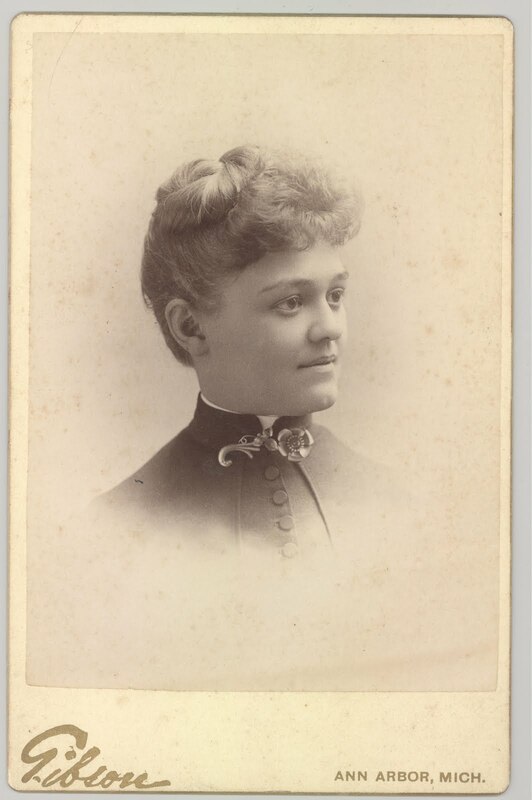 She was arrested under the truancy law and sentenced by Justice Joslyn. "The Queen City** Quartet will furnish music for the prohibitory amendment meetings which will be held." "The small boy should be happy, and economical. Three large circuses, Forepaugh's, Dorris', and Sells Brothers', will invade Michigan early this spring." 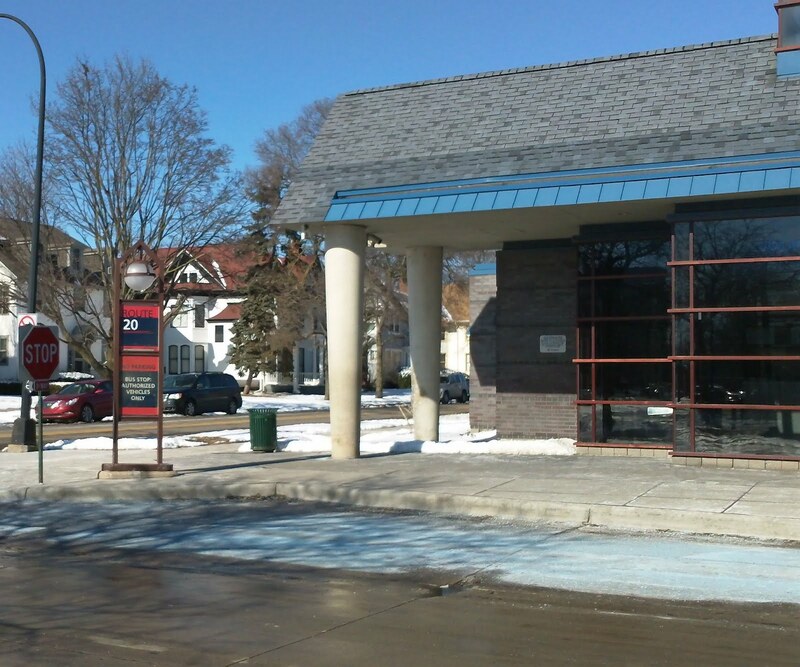 "The W. C. T. U. will meet at the Methodist chapel Tuesday afternoon, March 15, at 3 o'clock. Topic, Will the prohibitory amendment, if carried, interfere with the use of fermented wine for sacramental purposes? The question for discussion last week, That the tax or license system interferes with the liberty of a greater number of persons than a prohibitory law, was nearly unanimously decided in the affirmative." "The warm weather has brought out the bicycle, and during the past week Charlie Sweet has been putting his through an unusual number of gyrations much to the enjoyment of the spectators. Charlie has become an adept with the 'wheel'." *Adrian had a state institution designed for errant girls. Supposedly one main building on the grounds had basement jail cells where especially troublesome girls were kept. **Ypsilanti was one of several Michigan cities that gave itself the nickname "Queen City." Yesterday I was in Ann Arbor in a WUOM studio for an interview with Interlochen Public Radio about my recent Ann Arbor Chronicle sturgeon story. Here's the finished interview. Grateful thanks to both radio stations for their interest and assistance! Sarah Jane Norton Diaries: "Baked some to take on the road to Ypsilanti"
"The crowd that customarily greets the numbers of the Normal Lecture Course was on hand last Monday evening to listen to Mrs. Laura Dainty's readings. Her appearance did not predispose the audience in her favor, but before her first selection was finished she had their sympathy, and held it till the close of the entertainment. She has a good voice, well trained, and is perfectly at home before an audience, but her work as a whole does not compare favorably with Mr. Burbank's." "It must be evident to all candid minds that our people are not prepared to vote on the water works question, until they had more definite information as to a source of supply and the probable cost. What then justified the action of the Council in refusing to hire an expert to investigate the matter?" Mar 10: Wrestling match between Jake Martin of Ypsilanti and T. J. Murphy of Minneapolis. Mar. 15: M. E. Hawks, lecture on the prohibition amendment under auspices of W. C. T. U.
Mar. 17: St. Patrick's Day--the great play 'Devil's Auction or the Golden Branch,' under the personal management of Chas. H. Yale. Mar. 20: Col. Geo. W. Bain, of Ky., lecture under the auspices of the W. C. T. U. on the prohibition amendment. Mar. 21: Mendelshon [sic] Quintet Club of Boston, the last in the series of Normal Lecture and Music Course entertainments. Mar. 23: Sylvester Larned on the prohibition amendment under the auspices of the city committee. Mar. 24: Young Men's Prohibitory Amendment Club mass meeting--the addresses to be by young men. Mar. 26: Afternoon and evening, Prof. Morris' celebrated trained dogs. Mar. 31: Hon. John B. Finch under the auspices of the W. C. T. U., a lecture on [take a wild guess --ed.] the prohibition amendment. *She opened a millinery store. One recent discovery in the Archives is the 1895 literature notebook from Jessie Swaine, onetime domestic science instructor at Ypsilanti High School and the Normal School. 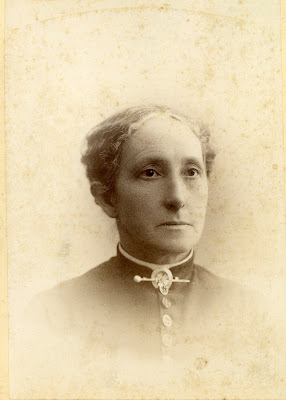 Jessie lived for much of her life in what is still called the Swaine house at the northeast corner of Forest and River. She wrote in this notebook when she was approximately 16 years old. 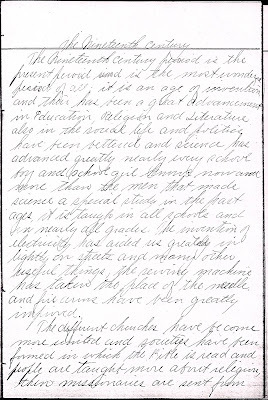 One of the entries is an essay on the 19th century. 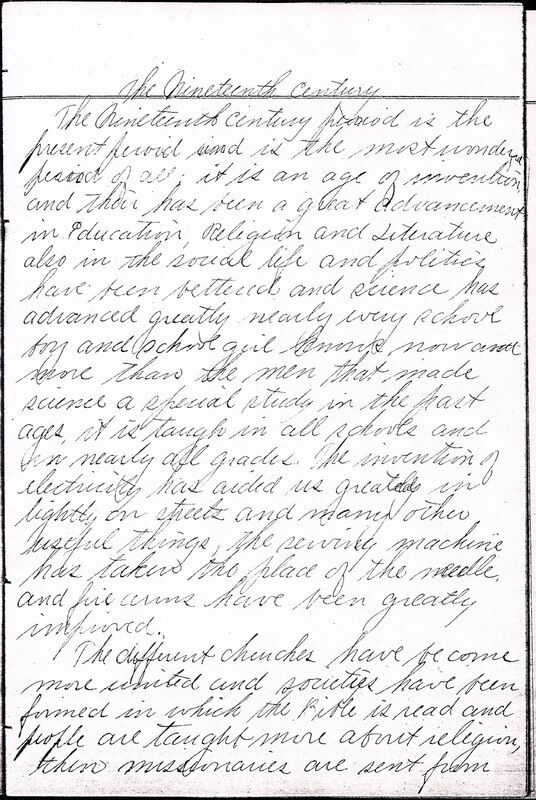 The Nineteenth century period is the present period and is the most wonderful period of all; it is an age of invention and their [sic] has been a great advancement in Education, Religion and Literature also in the social life and politics have been bettered and science has advanced greatly nearly every school boy and school girl knows now and more than the men that made science a special study in the past ages, it is taught in all schools and in nearly all grades. 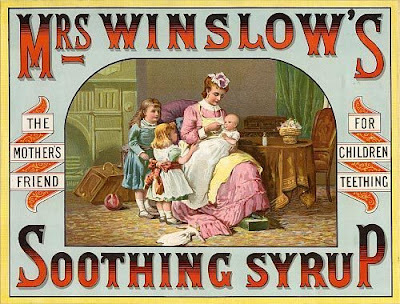 The invention of electricity has aided us greatly in lightly on streets and many other useful things, the sewing machine has taken the place of the needle, and fire arms have been greatly improved. The different churches have become more united and societies have been formed in which the Bible is read and people are taught more about religion, then missionaries are sent from Christian countries to countries where God is not known and they teach the people there so that the Christian religion is being spread all over the world. In Literature fiction has taken the place of the drama of the Elizabethan age and it is purer than it used to be, and treats more of the life and ways of people then of wars etc. We read not only for the story but for what we can get out of it, we find most of our best reading in the magazines and Reviews. Here's a view from what was until recently the Mongolian BBQ looking north. 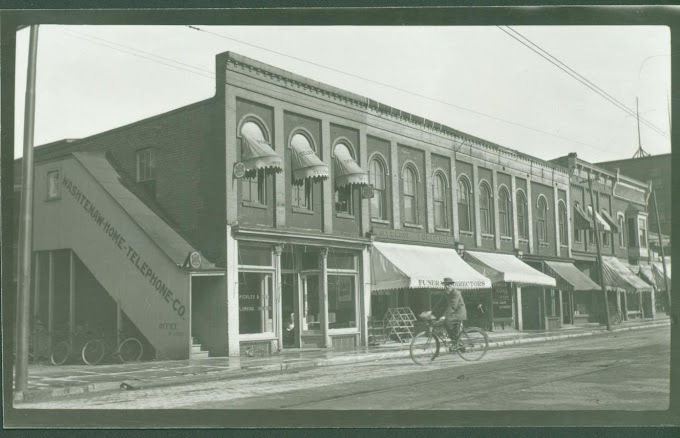 Long before it was the BBQ it was a Kresge's and is still known as the Kresge Building. Check out the Coca-Cola lettering on the tall white building in the middle of the east side of the street. Perhaps the building just to the south was built later, as it obscures the logo. The building just to the south of the Coke logo has a quite pretty facade, presumably still beneath the modern-day green covering. ...ok, so that's a ripoff from the commercial...but it was also a huge industry in late-19th-century Michigan! Grateful thanks to the Chronicle for publishing it. I have a new favorite fish, one who lives just 25 minutes from my home! "Monthly meeting of Washtenaw Pomological society on the 5th of March, at 2 o'clock p.m. in the basement of the Court House at Ann Arbor. Report of committees on fruit factory, on infusorial* earth, on best and cheapest fruit packages, on statistics. Prof. J. B. Steere will lead in the discussion on noxious insects and insecticides." "The Knights of Honor* up to this time have paid Mrs. James E. Lawrence $2,000, Mr. Lawrence being a member of the order when he died." "John Girdler and Carrie Gill of Grand Rapids have been convicted of adultery. Girdler pleads hard to be allowed to suffer the full penalty alone, but the judge thought both should be punished, and sentenced Girdler to the state prison for one year, and Carrie Gill to the Detroit house of corrections for the same time." "TORTURING PATIENTS. Extreme Cruelty Charged at the Soldiers' Home at Grand Rapids, Mich. LANSING, Mich.,--Some of the testimony given at the examination of the inmates of the Soldiers' home in Grand Rapids has been made public. The most damaging stories were related by Private Keyes and Baker. They swore that the principal nurse of the hospital--Sergt. Downs--so maltreated one of the inmates named Moore that he died the next morning. 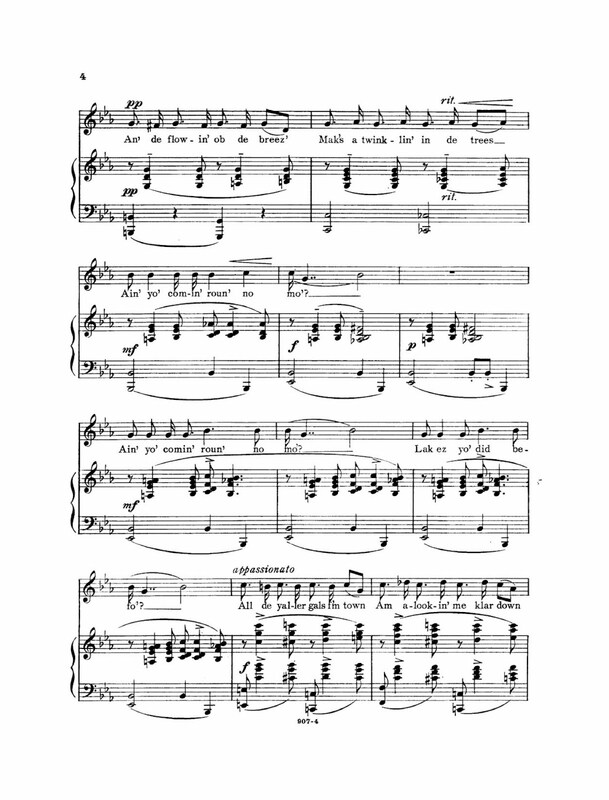 When the dying man objected to taking medicine, Downs said: "Take it, you d----- d----- ----- ----- -----, or I will throw you out of the window." The testimony shows that Downs jumped on Moore with his knees and forced obedience to his demands. Other specified instances of extreme cruelty are sworn to. One veteran swears that cayenne pepper was put in liniment in order to cause excruciating pain. Sick men were given icy baths. The testimony abounds in incidents in which the officials used profane and obscene language. Several of the subordinate officers admit to the profanity and try to justify it. The legislative committee says that these circumstances were unknown to the management." *one of the innumerable fraternal orders of the era. *diatomaceous, possibly used (as it still is) to deter insects by sprinkling on the ground around plants. Be sure to pick up a copy of this week's Courier to check out my story of the first black student at the Normal, class of '88! On a deadline so I'll post more later today if I finish my assignment. :) Thanks as always for reading! The onetime office of a Dr. Shaw. 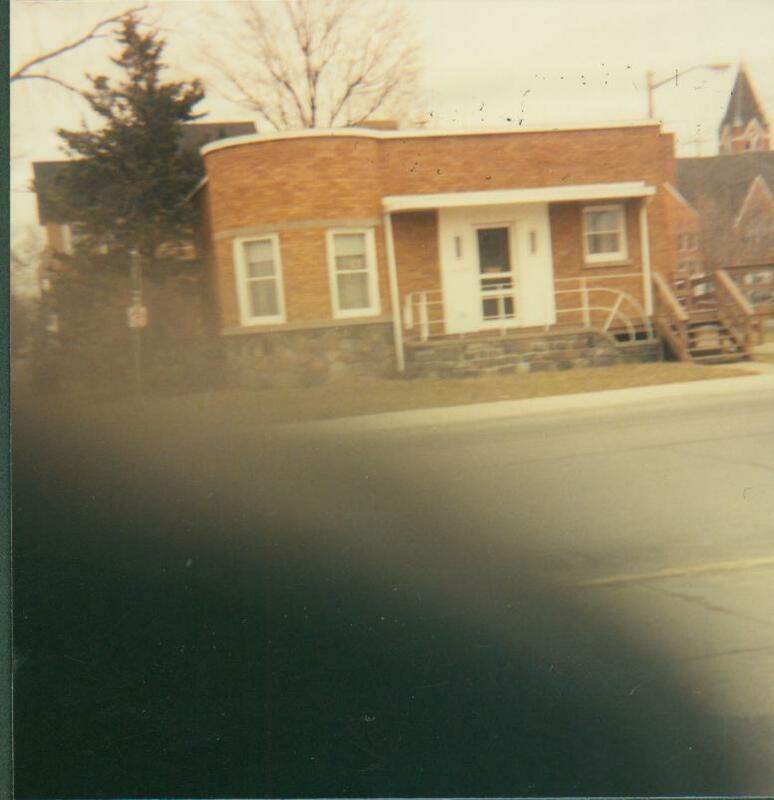 The odd little building also housed Catholic Social Services at some point in its history and was demolished when the bus terminal was built in 1991. On the night of February 21, a blizzard struck Ypsilanti, as part of the ongoing January-February cold wave. 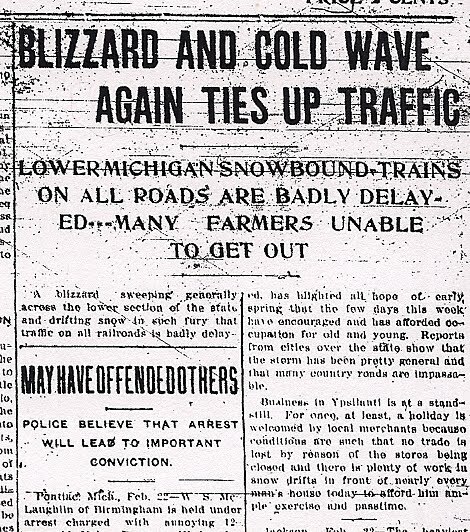 "Business in Ypsilanti is at a standstill," says this February 22, 1912 Ypsilanti Daily Press article. 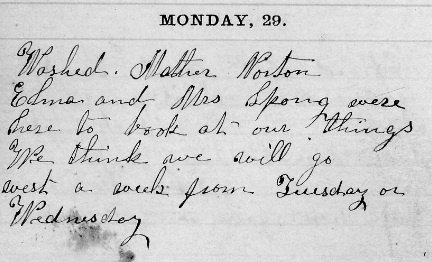 "For once, at least, a holiday is welcomed by local merchants because conditions are such that no trade is lost by reason of the stores being closed and there is plenty of work in snow drifts in front of nearly every man's house today to afford him ample exercise and [pastime]." 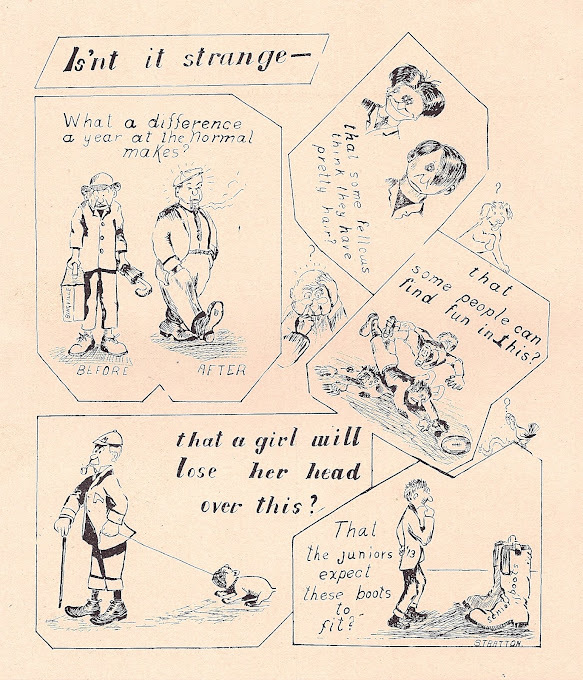 The storm's effects were also chronicled in the 1912 Aurora yearbook's joke section. 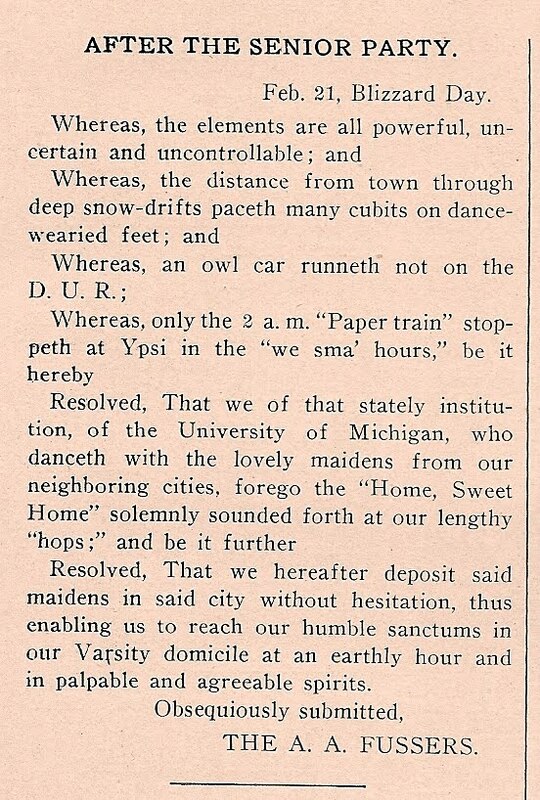 On the night of the blizzard, the Senior Dance had been held, with plenty of visiting would-be suitors from Ann Arbor. The poor things were caught in the midst of it. 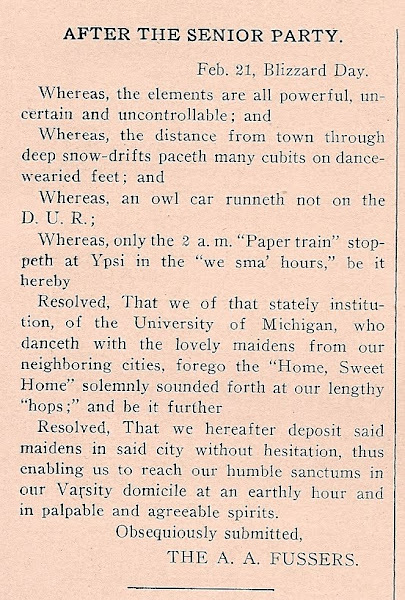 "Because the weather is unpredictable, with deep snow difficult to slog through, and because the interurban doesn't run a late-night car, leaving the only other option a ride from Ypsi to Ann Arbor on the 2 a.m. Michigan Central train, we U-M students will skip the traditional finale of our dance parties so that we can return our ladies to their homes earlier and arrive back in Ann Arbor in a timely fashion." 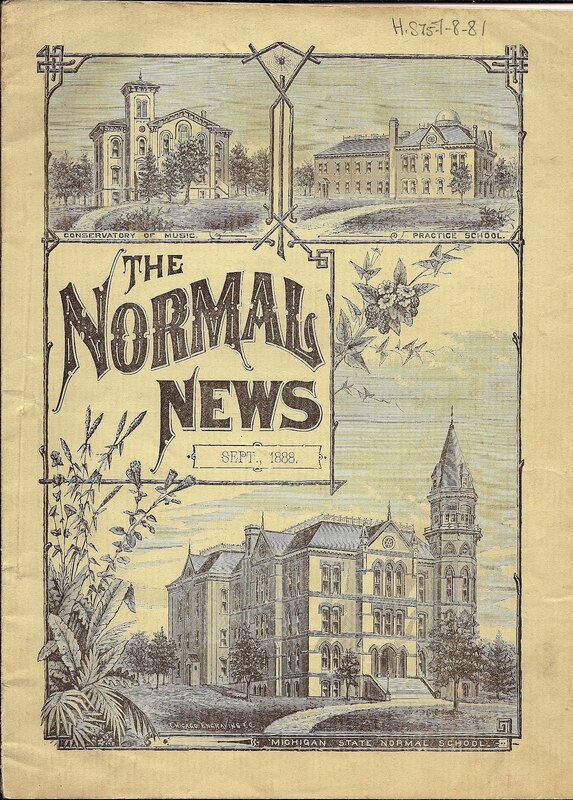 This September 1888 cover of the Normal News (predecessor to the Eastern Echo) gives a peek at the campus of yore. Clockwise, the buildings pictured are the following: music conservatory (now gone; Boone Hall stands in its place), the teacher practicum school (also known as the Old Main building, which with the Conservatory was one of the first buildings on campus), and the Old Main building again with its new 1888 additions. From this view, the Old Main building is concealed by the new three-story structure and tower in front of it. 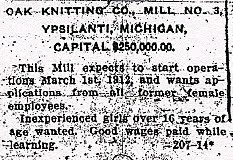 From the Ypsilanti Daily Press of February 14, 1912: this want ad for women workers at the Oak Knitting Mill, which was the last iteration of the Ypsilanti underwear factory. In a few years it closed and the building was taken over by Ray Battery for a time. 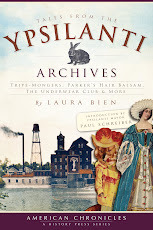 In its heyday the underwear factory was by far the largest employer of women in town--though in those days, the term "factory girl" had a pejorative meaning. 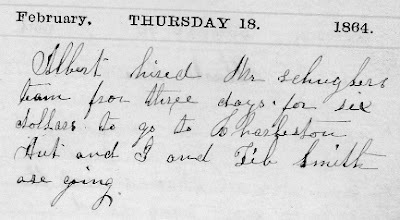 "There is a rumor abroad that Mr. F. J. Swaine* has refused to purchase barley from farmers in this locality on account of the submission of the prohibition amendment. ** Mr. Swaine says there is no truth in the statement." 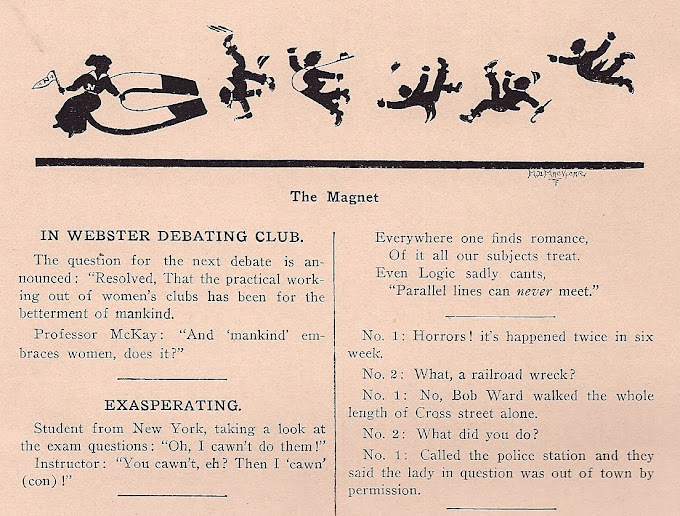 "MEMBERS OF THE BOARD OF EDUCATION.--Messrs." Why don't you clean out that sink of corruption, the privy vaults at the Seminary? Why don't you replace them by boxes, easily removed and cleaned at least monthly? We call the attention to the Board of Health to this matter." 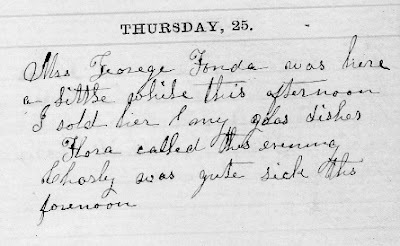 "Wednesday evening of this week a donkey social was given at the residence of D. L. Quirk, under the auspices of the Ladies' Aid Society of St. Luke's, which about 225 of our people attended. A number were present from Detroit and Ann Arbor. A very pleasant social and dancer were enjoyed. A prize was given the one putting the donkey's tail nearest the right place, a vase, which was won by Mrs. Dr. Watling; also one to the person getting it farthest away. The second prize, a miniature donkey, was won by Miss Maggie VanCleve, who received it with her customary grace of witty repartee. Miss VanCleve honored Chas. R. Whitman by pinning her prize on his coat. The "donkey" to this day remaineth at the house of one D. L. Quirk of Ypsilanti, and awaiteth the coming of the true owner thereof, when it shall be given unto her." "Mr. Cassler has winter lettuce, over the river, a number of beds, growing out doors in hot beds, very nice and tender. He left a specimen with us." **an amendment to MI's constitution adopted Nov. 1, 1916; MI ratified the federal 18th Amendment on January 2, 1919. 3. football (looks like a rugby ball, doesn't it? But the school had no rugby team and in fact in the football team photo, you can see the ball is distinctly rounded, as in cartoon). 5. an effete U-M dandy complete with cane, pipe, beanie, and bulldog. 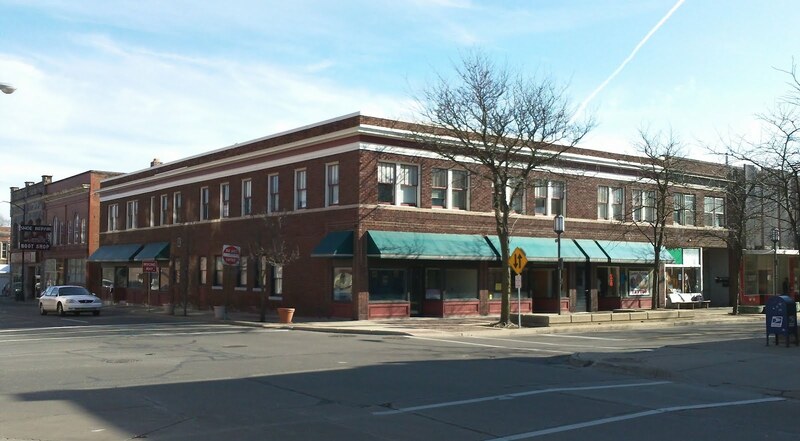 The Unity Building at 30-36 N. Washington occupied the onetime spot of Ypsi's storied "Ark" building. 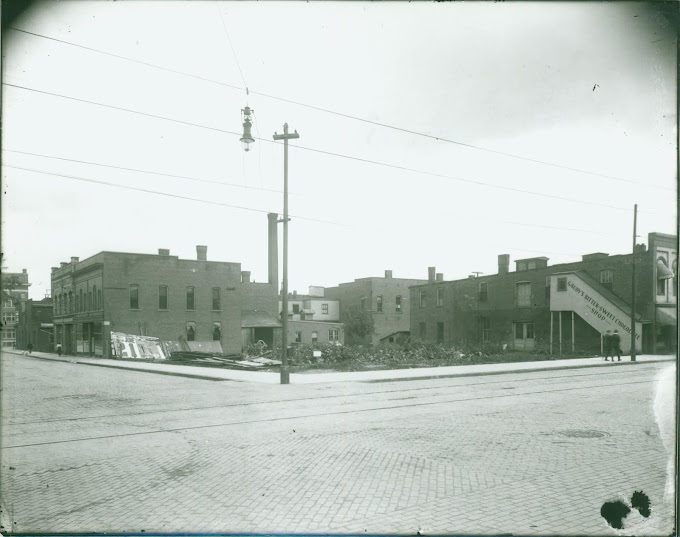 In the first photo, taken around 1915 shortly after the Ark's destruction, in the right background one may see the painted staircase of "Gaudy's Bitter-Sweet Chocolate Shop," formerly the Washtenaw Home Telephone Co. The second photo taken around 1920 or so shows the new Unity Building, and also shows Gaudy's. A marquee on the Unity Building advertises "H. Hutchins & Co.," a notions shop. On the northernmost window of the side facing Washington St. may be seen the Miller photography studio. 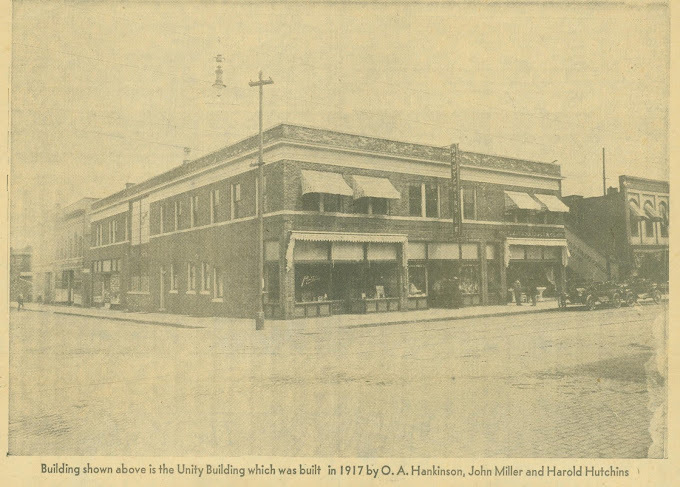 In 1924, a year after the Hotel Huron (Centennial Center) just across Pearl Street was built, the Unity Building housed these tenants in addition to the notions shop and photo studio: osteopath John Garrett, chiropractor Arthur Bourget, insurance agents John Crampton and Edward Crawford, Ye Corset Shop, dentists Don Moe and Hugh Morrison, Edna Hickman's children's wear store, doctors Harold Barss and Walter Wright, the Illinois Life Insurance Co., the Christian Science Reading Room, Tweedie & Gibson barbers, and the Goodrich Hair Shop. 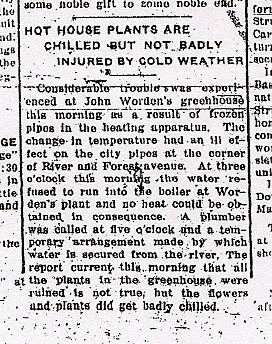 Click to read more about: 1910-1920 , unity building , washington st.
2/15/1912: Peckville-Area Worden Greenhouse in Danger! Here's one side effect of the severe cold wave Ypsi was experiencing in January and February of 1912. 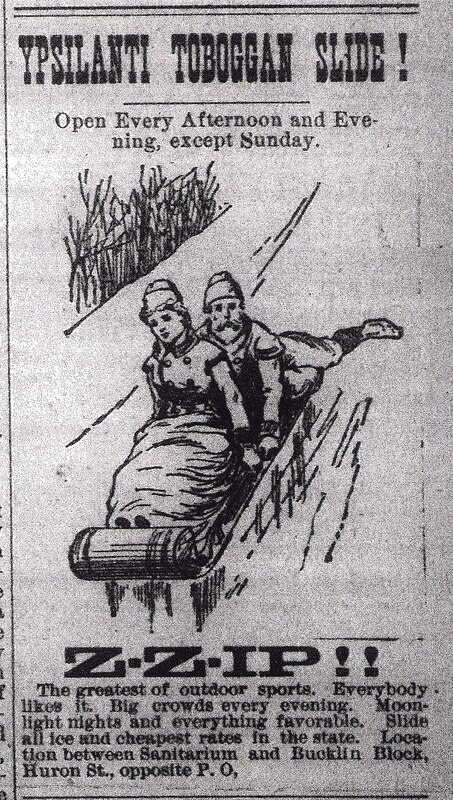 This item is from the February 15, 1912 Ypsilanti Daily Press. John Worden was a florist. 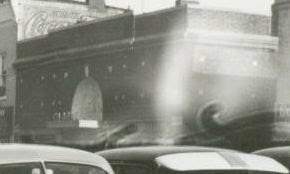 His greenhouse was on the east side of River Street opposite Highland Cemetery, and his home was at 733 River on the west side of the street. The site where John's home stood is now the small empty field on River across which one can see the Corner Brewery. 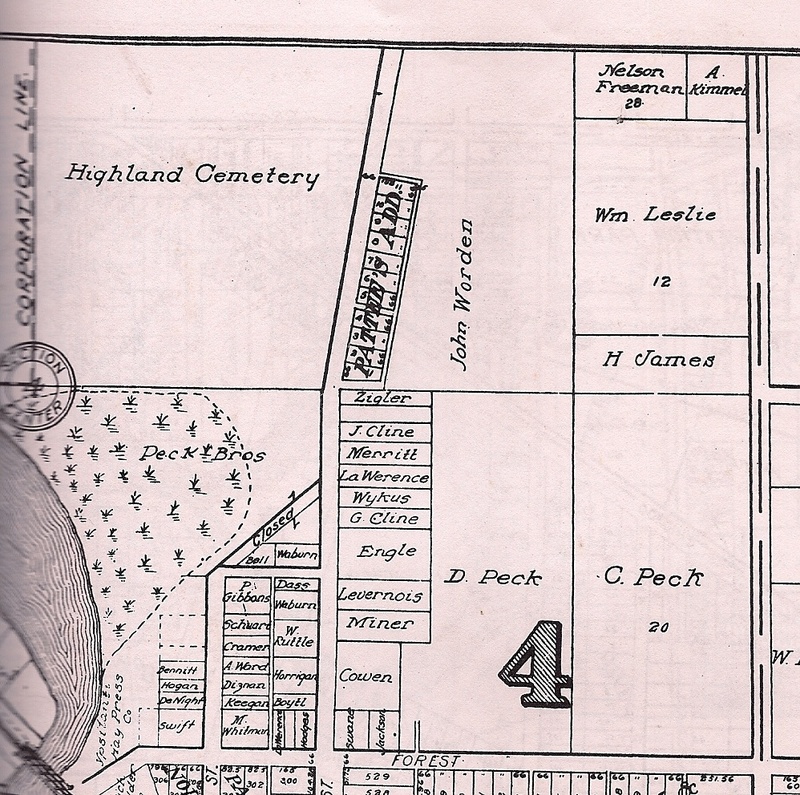 John had landholdings opposite the cemetery, as seen below. 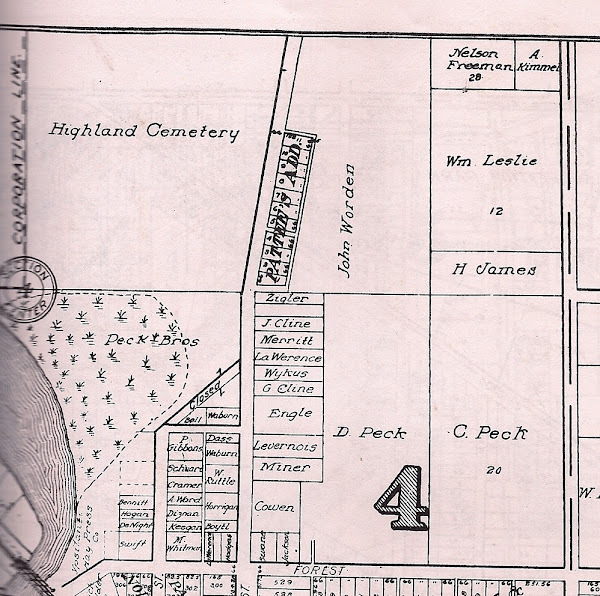 His Peckville-area land adjoined properties held by machinist Robert Ziegler (possibly misspelled on plat map), dairyman Dwight Peck, cider manufacturer Harvey James, William Leslie, and Nelson Freeman. The little sliver cut from its southwestern edge is labeled "Pattee's Addition." Thank goodness John could fetch water from the nearby river for his greenhouse boiler, that chilly day! No. 1: Horrors! It's happened twice in six week[s]. No. 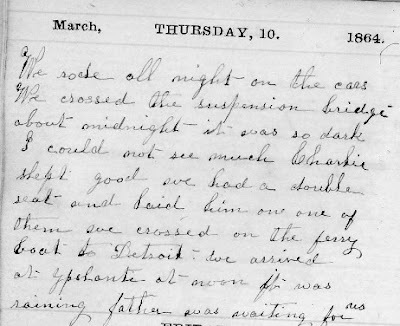 2: What, a railroad wreck? No. 1: No, Bob Ward walked the whole length of Cross Street alone. No. 2: What did you do? No. 1: Called the police station and they said the lady in question was out of town by permission. Hmm, so who was this Bob Ward? Senior class president, it turns out. He was also a member of Alpha Tau Delta, chairman of the Y.M.C.A., a member of the Lincoln Debating Club, and represented the Normal for two years at oratorical contests. Quite the accomplished young man. But you do wonder if part of his popularity with the ladies had anything to do with his appearance as well. Quite the handsome young man, isn't he? ...when it came time for Bob Ward to persuade a young lady to take an evening stroll up Cross Street. 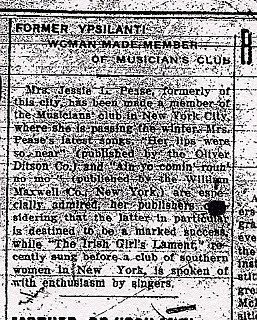 Mrs. Jessie L. Pease, formerly of this city, has been made a member of the Musician's club in New York City, where she is passing the winter. 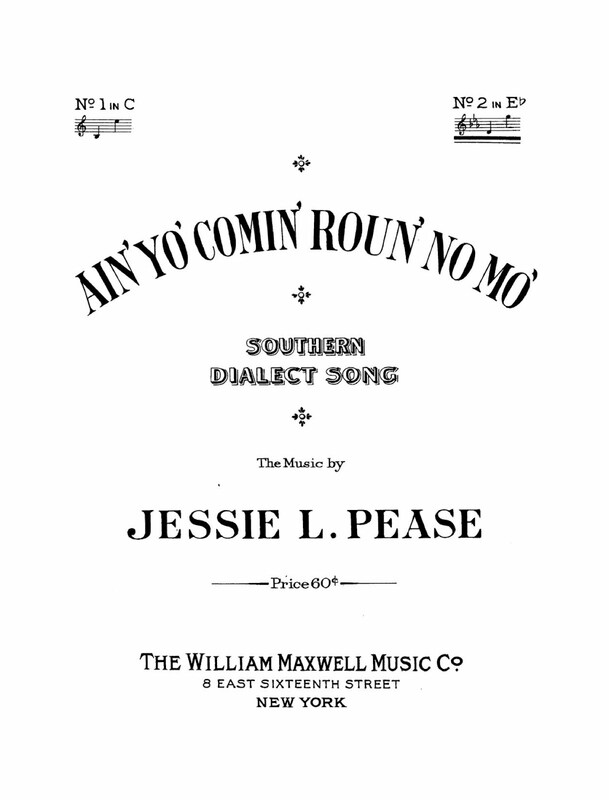 Mrs. Pease's latest song, "Her lips were so near" (published by the Oliver Ditson Co.) and "Ain yo comin' roun' no mo'" (published by the William Maxwell Co., New York) are especially admired by her publishers considering that the latter in particular is destined to be a marked success, while "The Irish Girl's Lament," recently sung before a club of southern women in New York, is spoken of with enthusiasm by singers. Jessie Pease's 1906 song "Ain' yo' comin' roun' no mo'" was advertised as a "Southern Dialect Song." 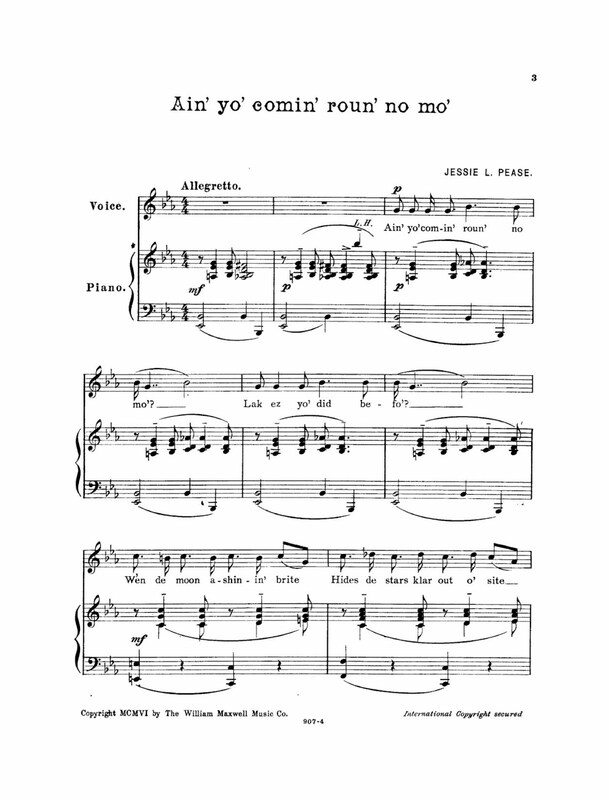 Below is the sheet music and lyrics. The publisher, the William Maxwell Co., was at 8 East 16th St., New York. Note: Charleston, NY is about 15 miles from Sharon Springs as the crow flies. "The Milan Journal has gone where the woodbine twineth. * Mr. Smith, of the Leader, has bought it. It is as much as one paper can do to live there, saying nothing about two." "When a woman gets on a street-car and spreads out her skirts so that she occupies two seats, you can make up your mind that her husband sits on the edge of his chair and says 'Yes m'm,' 'No, m'm," to her. --New Haven News"
"CONCEALED IN A CARCASS: The Body of a Man Found in the Carcass of a Dead Horse. 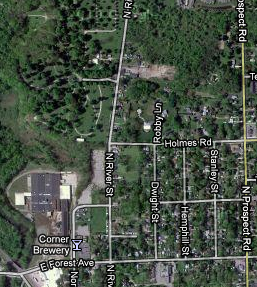 LOUISVILLE, Ky.,--A most horrible discovery was made in Green county, this state, last Saturday. The dead body of John Keeth was found wrapped in a blanket and concealed inside the carcass of a dead horse. 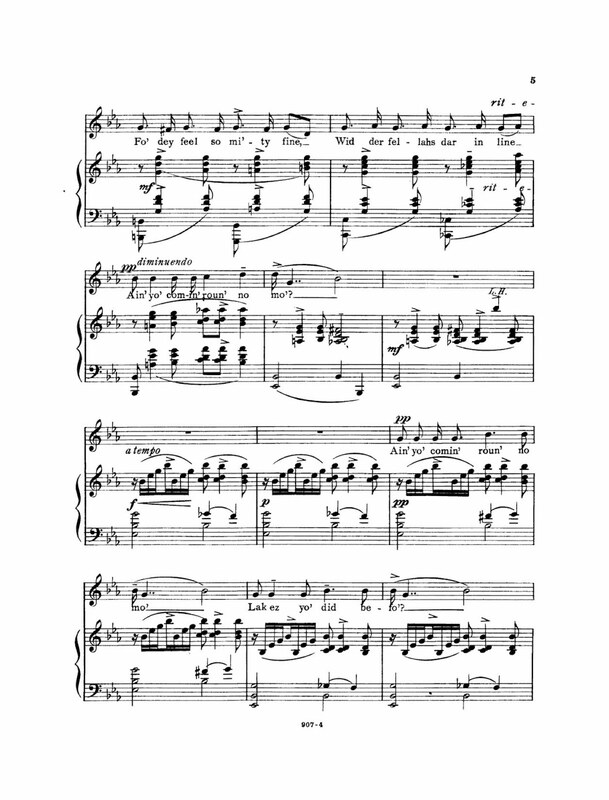 It is supposed that he was murdered and his body concealed there by the murderer. 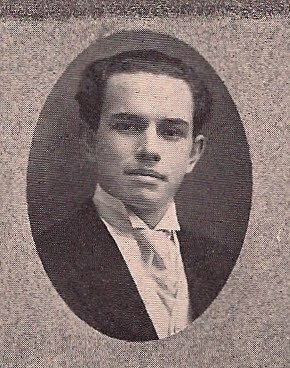 Keeth was a brother-in-law of William Despain. He had been missing for several days, but no search had been made for him, his friends supposing that he was away on a visit, until a dog belonging to William Despain came into the house on Saturday morning, carrying something in his mouth which, when examined, was found to be the hand of a man. Mr. Despain tracked the dog to the carcass of an old horse, and was horrified to find the body of his brother-in-law therein, half eaten up by dogs. It was a horrible sight. The mystery connected with the affair will probably never be solved. Keeth was a married man and the father of six children." "The Seniors, Juniors, and teachers of the High School were invited to a candy pull, Thursday evening, at the residence of Mr. H. F. Miller. It was given by Misses Dora Ambrose and Blanche Mott. They all had a very enjoyable time." "The privy vaults must go. Citizens of Ypsilanti, shall these putrid pits of disease and death remain? Why not before spring comes have them substituted by dry privies, boxes? Why not have a city scavenger employed to see that all excretions from these, and all the offal in barn yards be removed monthly?" "The Commercial tenders its thanks to D. W. Shipman for a bunch of celery which is certainly of a high order allowing us to be judge." Here's a little gem I came across in an 1880 edition of the Ypsilanti Commercial. 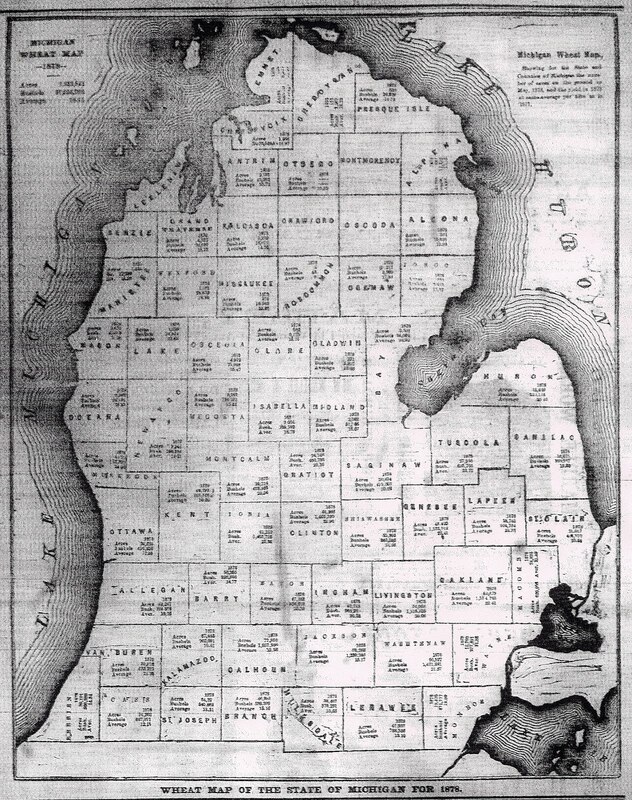 It's a "Wheat Map of the State of Michigan for 1878." Almost every county has stats for acres under cultivation, bushels of wheat produced, and average number of bushels per acre. The only states producing more than a million bushels are several in the second, third and forth tiers of counties north of the Ohio border. 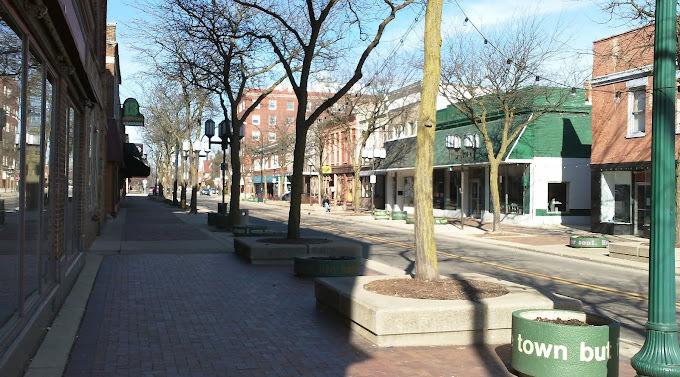 They are Calhoun, Jackson, and Washtenaw; Livingston and Oakland; and Ionia, Clinton, and Genessee counties. Washtenaw is also one of the counties with yields of over 20 bushels an acre. Now, who is (what looks like) that lonely and despondent wheat farmer up in Roscommon County? He's got 6 little acres up there that yielded 48 bushels, for a meagre 8 bushels per acre. One hopes that poor man found better fortune. There is no wheat at all reported in several upper lower peninsular counties: Oscoda, Crawford, Benzie, Leelenaw, and Montmorency. Also, Arenac county has not yet been carved from Bay County, and Kalkaska is spelled Kalcasca, the latter of which sounds like one of the innumerable miraculous patent medicines of the day. Sunday Feb. 12, 2 p.m. at the Archives: "Name That Photo!" Following the program, refreshments will be served and museum tours will be available. Debi Hoos-Lemke, a recent graduate of Wayne State University, has been working at the Ypsilanti Historical Society Archives for the past year on the Digital Photo Archives Project. 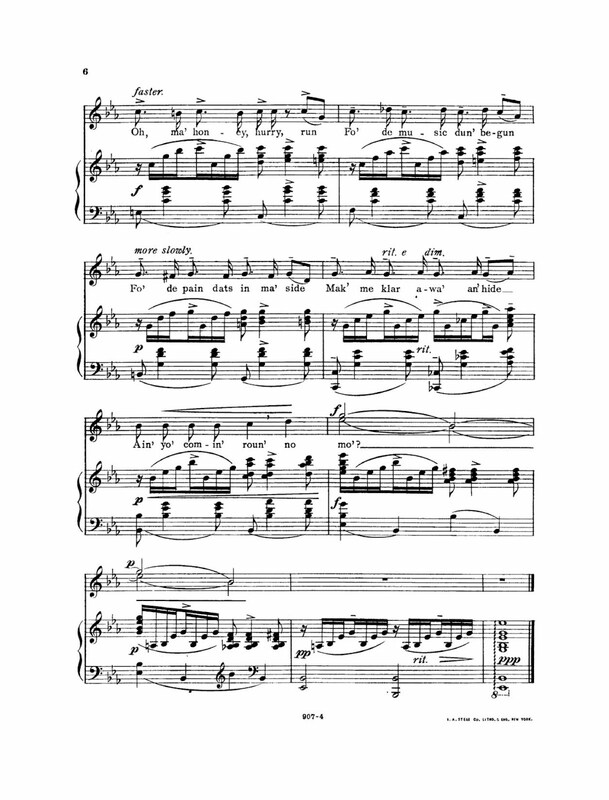 This is a collaborative project with the University of Michigan Library Production Service. 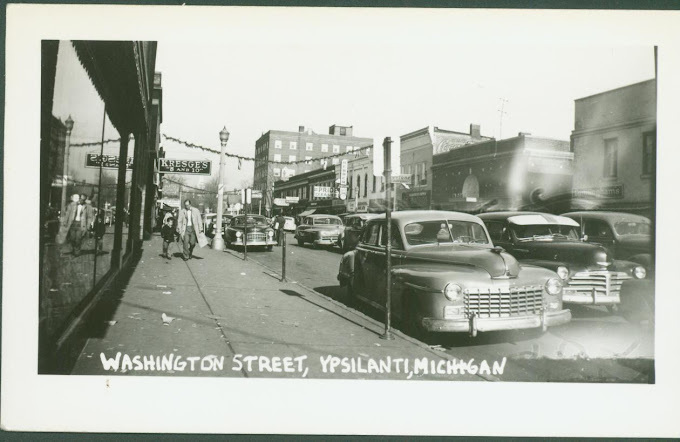 The Photo Archives Project is a diverse collection covering all aspects of Ypsilanti history. The earliest photographs in the collection are from the 1850’s. Subjects range from people, automobiles, trains, planes, events, buildings, school and colleges, organizations, cemeteries and much more. The Washtenaw Home Telephone Co. occupies the second floor of 24 N. Washington. On the ground floor is the plumbing firm of Pickles & Bassett. Next door at 22 Washington on the ground floor is Jay Moore's furniture store. Moore was also a funeral director and embalmer. 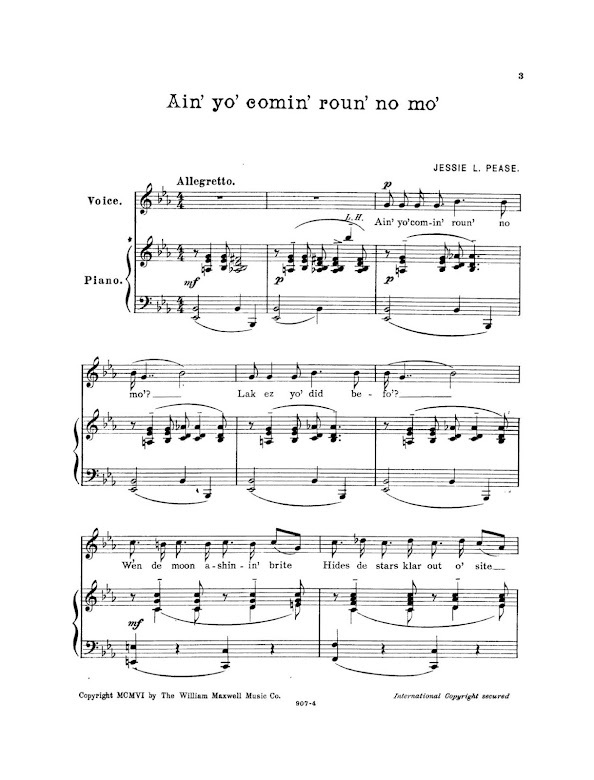 (Possible motto: "From Crib to Coffin.") At 20 Washington is Frank Stowell's coal office. Upstairs are the offices of lawyer Frank Joslyn and dressmaker Helen Francisco. 18 N. Washington houses Harry Gilmore's wallpaper shop, and 16 N. Washington is Dewey Waterman's plumbing shop. The tall building in the middle right background is the onetime second-floor Hewitt Hall. Many neighborhoods, especially those with HOAs, have deeds with restrictive covenants that govern the use of the property. Such covenants may, e.g., specify a certain setback as an easement for public utilities, define what constitutes a forbidden nuisance to neighbors, or describe the types of structures that may (or may not) be built on or added to the property. In 1926 the Supreme Court allowed the explicit use of racially restrictive covenants in land deeds. Subdivisions all over Southeastern Michigan (and elsewhere) wrote such covenants into their deeds, and Ann Arbor and Ypsilanti were no exception. 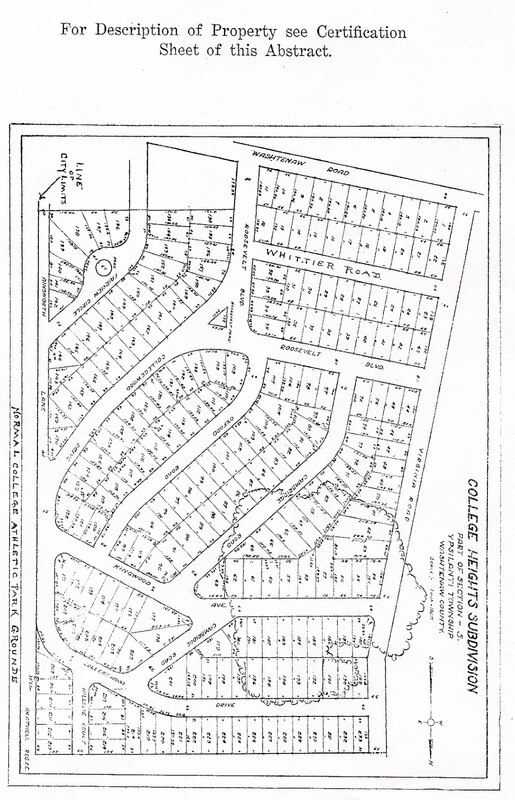 One such example for Ypsilanti may be seen in the 1941 deed for the subdivision of College Heights, just north of Washtenaw and west of the EMU campus. Below is a map of the original development. The College Heights deed is dated 1941. Seven years later the Supreme Court in Shelley vs. Kraemer forbade racially restrictive covenants in land deeds. However, there were other means, both widespread and local, of segregating neighborhoods, such as redlining or denying home loans to black Ypsilanti residents. Both practices are related in oral histories of black residents collected by A. P. Marshall and stored in the Ypsilanti Archives. 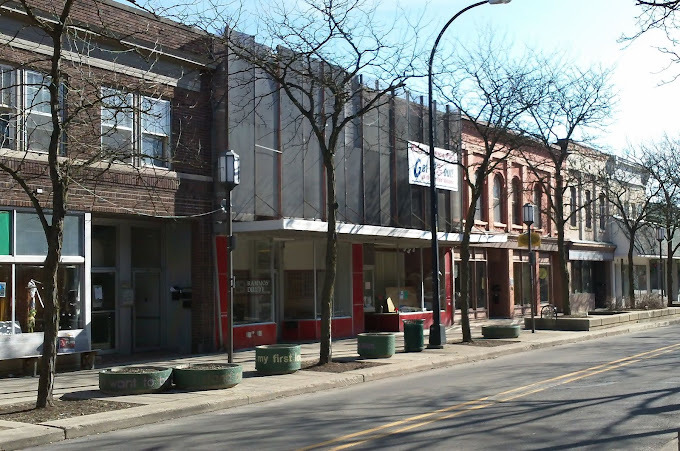 Such aspects of Ypsilanti history as this restrictive covenant are painful to acknowledge. However, it is important to preserve and be aware of items like these for an honest portrayal of the past. Thanks to the Courier for publishing my story about a onetime MASSIVE structure in what was to become Riverside Park, made to enjoy a sport that was just catching on in 1886-7. 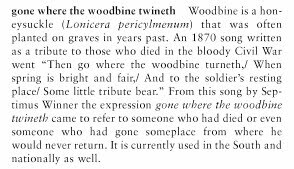 I had never heard of this item before, and it seems to have been a flash in the pan that vanished almost immediately from the scene. Still researching what happened to the structure. So far all I've found is that it was partially damaged in a big flood in the spring of 1887--in fact, the bottom part was partially washed away but prevented from doing so by the trees in the park. I'll definitely publish an update when I find out what happened to the vision of these five young dreamers.